Overview: TK Audio is a new brand established by Thomas "TK" Kristiansson, the man behind Vintagedesign. TK Audio was created to satisfy people with a desire for gear with a modern structure combined with genuine craftsmanship. Our first product, BC1, was launched in the fall of 2008 and was a huge success. We aim to exceed your expectations and we trust your response to be just as warm as it was for our Vintagedesign products. Our opinion: High quality analog tools, with great headroom and excellent noise performance. These well designed modules will help you get the best out of your API rack set up. The TK-lizer 500 features all the power of the TK Audio’s flagship TK-lizer, including the M/S functionality that has made it such a staple in studios all over the world. The three bands have a cut/boost range of +/-8dB in 41 steps. The low and high bands can be switched between peak or shelving mode. A high pass filter with a 12dB slope is also provided, and each channel has it’s own level control with a range from infinity to +6dB. Using the built in M/S function, you can adjust the middle and side signals separately before it is decoded back to a normal L/R signal. In M/S mode you can also adjust the stereo width using the level controls. 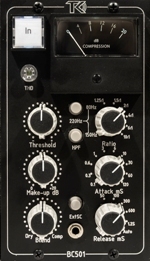 Featuring all the power of TK’s flagship BC1-S, the new BC-501 stereo bus compressor adds even more functions taken from the BC2-ME mastering compressor, such as additional ratio settings (1.25:1, 6:1), a THD switch that adds more even harmonics to the signal, and three HPF settings from which to choose (80Hz, 150Hz, 220Hz). All controls are detented for easy, precise recall. 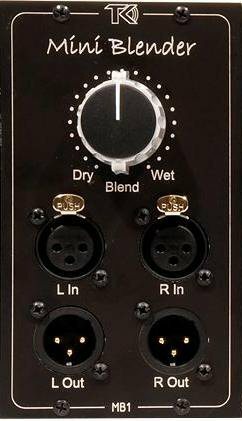 A dedicated Wet/Dry knob allows blending between the original and compressed signals, and an external sidechain input (accessible via stereo 1/8" mini TRS jack) is also provided. Click here for the official TK Audio BC501 demo video. Click here for the Gearslutz BC501 discussion with user comments. The Mono Blender is the perfect tool for parallel processing. 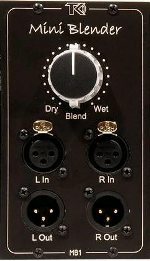 Insert your favorite compressor into the front panel XLRs and blend it with any other audio signal being simultaneously fed through the unit with absolutely no degradation to either source. It’s also ideal for dialing in the perfect balance between sources recorded with two different microphone systems, such as electric guitar, upright bass, or acoustic piano. All inputs and outputs are electronically balanced, and the rugged blend control has 21 steps for precise adjustments. A miniature version of the 19" Blender! Mini blender for parallel processing: Insert your favourite processor to the front XLR's and blend it with the signal that is fed through the unit. All inputs and outputs are electronically balanced. The blend control is a high quality potentiometer with 21 steps. A high-pass and low-pass filter with 6dB or 12dB slope. Each section has a x10 switch for a broad range. HPF range: 30Hz-480Hz or 300Hz-4.8kHz. LPF range: 100Hz-2.2kHz or 1kHz-22kHz. A miniature version of the Transceiver. The main function is to convert balanced +4dBu signals to unbalanced and back again. The TC1 does not use any transformer so it does not add any color to your sound. It's an insert station. Insert your balanced gear such as guitar pedals and old echo fx into your DAW or consol. It's an active DI-box with up to 26dB of gain. Plug your favourite instrument into your collection of vintage gear via the TC1. MONITOR switch allows the back panel XLR signal to be routed to the input, through the Send amp, for reamping. LINK switch routes the front panel Input Jack signal to the front panel Output buffer (Jack), for reamping. Hi-gain 500-series preamp (max +80dBs). Classic Opamp design running in Class-A mode. Selectable Germanium stage for extra harmonics. Switchable -30dB pad (on the input). Sweepable high-pass filter, 30-400Hz, 12dB/oct. Impedance switch: 1600 ohms / 400 ohms. Hi-Z input, instrument input with more than 2Mohm input impedance. Selectable output stages, electronically balanced or discrete class-A output stage with Carnhill transformer. Power requirement: +130mA / -130mA. TK LIZER 500 (stereo EQ): 1015€ Exc. VAT / 1228,15€ Inc. VAT. IN STOCK. BC 501 (stereo comp): 875€ Exc. VAT / 1058,75€ Inc. VAT. IN STOCK. Mono Blender: 310€ Exc. VAT / 375,10€ Inc. VAT. IN STOCK. MB1 (stereo Blender): 405€ Exc. VAT / 490,05€ Inc. VAT. IN STOCK. TF1 (2 band filter): 310€ Exc. VAT / 375,10€ Inc. VAT. IN STOCK. TC1 (Transceiver): 310€ Exc. VAT / 375,10€ Inc. VAT. IN STOCK. 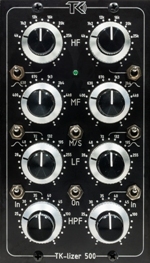 SP501 (mono mic preamp): 657€ Exc. VAT / 794,97€ Inc. VAT. IN STOCK. 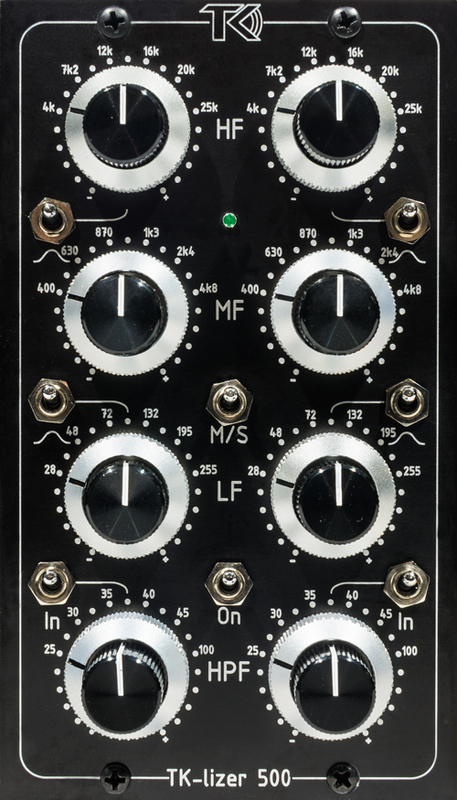 This is one of the most transparent stereo bus compressors ever made, it’s manufactured and assembled in Sweden and thoroughly tested before leaving the factory. The BC1-THD has several new functions like the THD function, three HPF frequency and the new “Grab” function which adds a more obvious compression character in addition to the usual transparent mode that BC1 is famous for, perfect for the drum-bus. Our opinion: A great re-introduction of the BC1 concept with even more features. It is the direct successor of the BC1-S and internally identical to the Ltd. released in 2018. It's also the first TK Audio comp to feature an exclusive TK VU-Meter. Price: 1071€ Exc. VAT / 1295,91€ Inc. VAT. 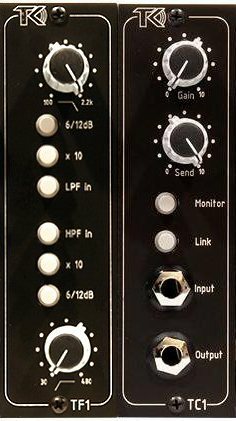 TK's new TK-lizer 2 is a Baxandall type of EQ, high and low bands are selectable between shelving or bell, very useful for fine tuning of your low’s, mid’s and high’s. The EQ also has a built in M/S function which lets you process the mid and side signals separately. You can also affect the stereo width of your music by using the level controls in M/S mode. The three bands are based on the legendary Baxandall circuit from the 50’s. Available in black or limited edition brushed silver. Our opinion: Superb mastering EQ with a transparency reminiscent of the best past German Broadcast designs. The MS function has found fans in engineers mastering for Vinyl. High end performance but reasonable price as usual with TK. BLACK VERSION: 1334€ Exc. VAT / 1614,14€ Inc. VAT. IN STOCK. BRUSHED SILVER / LTD. VERSION: 1334€ Exc. VAT / 1614,14€ Inc. VAT. OUT OF STOCK. 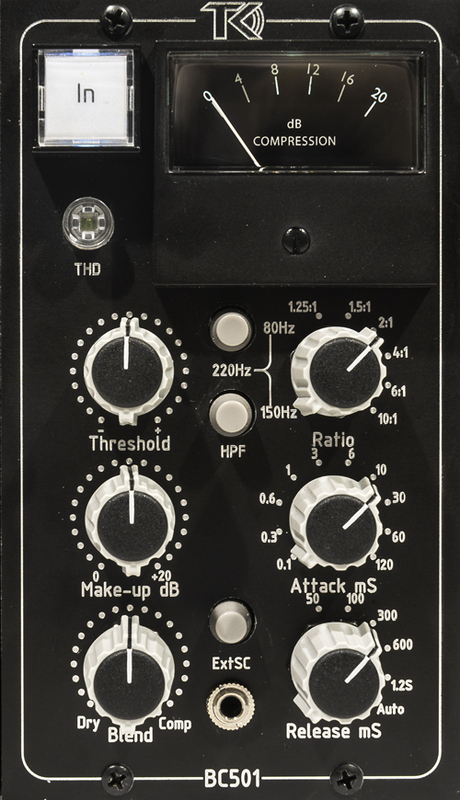 The DP2 is a dual channel preamp based on a unique hybrid design including both vintage and modern circuits. Germanium and silicon transistors, along with integrated circuits, make the sound character expand over several decades. The midrange crunch of the germanium sound of the mid 60's, the low mid punch and thick sound associated with British class-A from the early 70's and the modern tone from the 80's and 90's; all in the same box. The input-stage is built around a high quality Swedish Lundahl transformer. The preamp section is followed by a germanium unity-gain stage for coloration. Finally the DP2 has two different output stages, an electronically balanced output stage or a discrete transformer-balanced class-A stage, built around a heavy Carnhill output transformer. The vintage class-A mode produces a fat and punchy sound with mid range character and a warm top-end; the germanium mode adds even more harmonics to the sound. The IC-based output stage is less colored and perfect for clean amplification. With up to 80 dB gain the DP-2 can handle quiet sound sources like ribbon microphones. High impedance inputs are positioned on the front for easy access when connecting guitar, bass or synthesizers. It's also possible to crank up the input gain really loud and run a hot signal through the preamp to make it distort, and then use the output volume control to lower the output gain. The DP2 offers a unique set of flavors at a very sensible price. JANUARY 2018: TK Audio replaces their flagship DP1mk3 with the DP2. The major updates from the DP1mk3 to DP2 are a sweepable HPF from 30Hz to 400Hz which allows precision crafting of the low end, and a separate switch to activate the instrument input. The power supply has also been updated to for lower noise. Our opinion: with flavours going from a clean ISA to a vintage Germanium NEVE, the DP2 offers a wide range of tones, especially when overdriven. Superb tool for recording electric guitars. Input impedance switch: 1600 ohms / 400 ohms. Price: 1250,00€ Exc. / 1512,50€ Inc. VAT. Mini mastering console / multiple insert loops controller. Our opinion: Very intuitive, transparent, high quality switcher/mixer for mixing/mastering. Mode 1 - Insert 1 active on channel 2 for parallel processing. Mode 2 - Insert 2 is placed before the split point. Mode 3 - Insert 2 is placed in series with Insert 1. Mode 4 - Insert 2 is placed after the mix point. 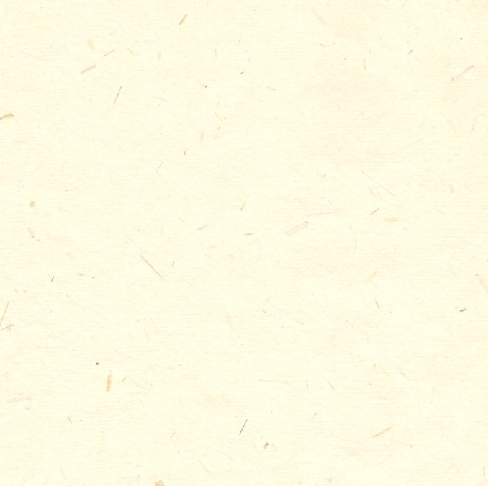 Mode 5 - Insert 2 is active on channel 3 for parallel processing. 115 or 230V selectable inside. Price: 1110,00€ Exc. VAT / 1343,10€ Inc. VAT. Our opinion: A lifesaver interface, the Transceiver allows instrument level signals and balanced Pro signals to live happily together. Transparent and extremely flexible. It's an insert station. Insert unbalanced gear such as guitar pedals and old tape echo fx into your DAW or console. Price: 686€ Exc. VAT / 830,06€ Inc. VAT. OUT OF STOCK, PLEASE INQUIRE.